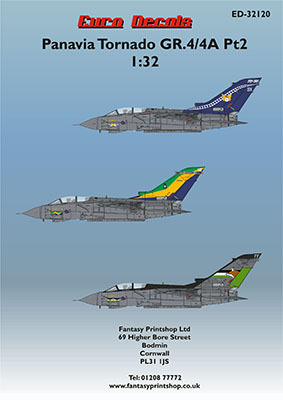 Following on the heels of their previous release is another Panavia Tornado set from Euro Decals, this time with three colorful schemes. These three aircraft are all 90th anniversary aircraft of their respective squadrons, all from 2005. The set comes on a single large sheet, which is not surprising given the size of a 1/32 Tornado kit. The units covered include 13 Squadron, 14 Squadron, and 15 Squadron. All are finished in the earlier Tornado scheme of Dark Sea Grey upper surfaces over Camouflage Grey lower surfaces. Starting with 13 Squadron, this aircraft is ZA401, a Tornado GR.4 based out of RAF Marham and flown by Wing Commander Ian Wood & Squadron Leader Laurie Fisher. 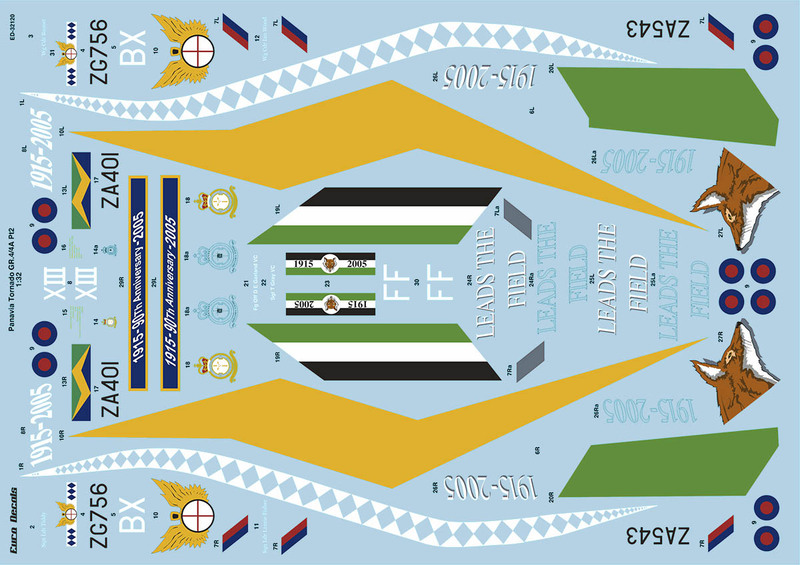 This plane has a three-color vertical fin in the squadron colors of blue, yellow, and green. To aid in the masking of the complex design, the yellow center section is provided as a decal. Anniversary text is on the fin tip ECM block, and the squadron emblem is also on the tail. Next up is ZG756, a Tornado GR.4 from 14 Squadron out of RAF Lossiemouth. The squadron design for this unit is blue diamonds on a white field, so to make this more colorful they painted the whole tail blue and added a white sash with blue diamonds in it. It makes for a striking scheme, and for the decals, only the white portion is printed, making it an easy one to set up. Also on the tail is the squadron emblem and the anniversary years of 1915-2005. Finally is 15 Squadron, which is represented with a Tornado GR.4, ZA543, also from RAF Lossiemouth. This option has a simpler design for the tail, with the anniversary markings not taking up the entire tail. The fuselage spine, fin leading edge, and fin cap are all black, while the rudder is green. Centered on the tail are the squadron's colors of black, white, and green in stripes, with the squadron's fox head in profile. The decals are well printed with excellent color. The balance of providing some decals for the fins is a solid compromise, and any one of these schemes would look great on a big 1/32 Tornado. It is nice to see these colorful schemes available in 1/32, and for those who build smaller, 1/48 and 1/72 sheets will soon be following. If you're looking for a colorful Tornado, definitely check this sheet out. My thanks to Fantasy Printshop for the review sample.